Marlboro cigarettes interesting facts, news, articles. Find a large variety of fresh tobacco stories, Marlboro cigarettes collectibles, old Marlboros packs or top celebrities using this so popular cigarette brand. Wang Guanyi is 46-year-old cigarette pack collector from Longnan, China and he recently built a fort model from 600,000 empty cigarette packs. According to his words, Wang has been fascinated with cigarette packs ever since he was little and collected his first one off the street, when he was just seven years old. He was first attracted by the intense colors and nice images on the packs, and kept collecting them until he reached an impressive 600,000 several decades later. 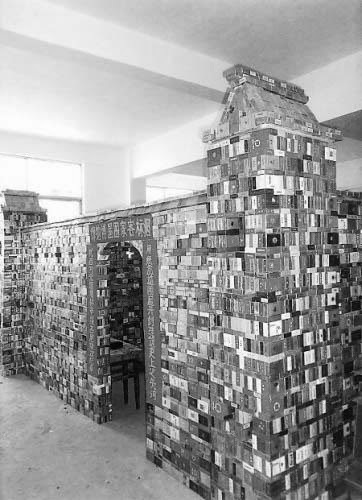 After he saw a TV show about a man who had built a house out of wine bottles Wang was inspired to do the same thing with his cigarette pack collection. It took him about a month to finish his 30-foot fort-like building made with 600,000 colorful cigarette packs. 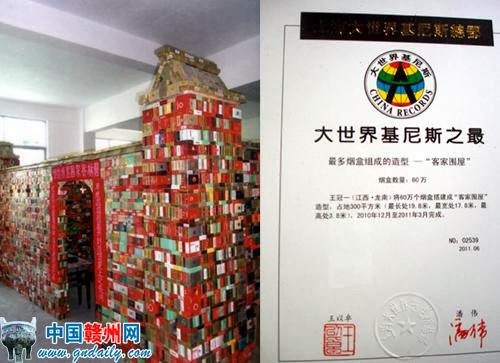 It was 6.06m long, 4.68m wide and 1.68m wide, and won Wang Guanyi a certificate from the China Record Office for the world’s largest cigarette pack structure. Unfortunately he was forced to tear down the castle as soon as his record was acknowledged, due to space related problems. Copyright (c) 2014 Marlboro Cigarettes Online Blog.